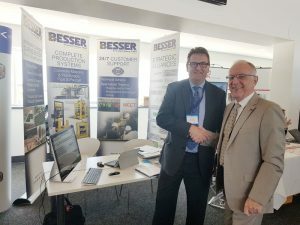 At the British Precast Show and Annual Meeting during mid-May Mike Munro, Besser International Sales Manager enjoyed the opportunity to meet with producers and provide suggestions to address their needs for improved production and expanded product lines. The famous Silverstone Raceway conference facilities in Northamptonshire was the site for the full day of events. Events included presentations, workshops, the exhibition, featuring a record high of 75 exhibitors, and the annual general membership meeting. Visit www.britishprecast.org for more information. of the British Precast Concrete Federation.